The Long Bridge had never been built to handle the size of traffic now on our roads, so in 1986-7 the A39 took a different route. 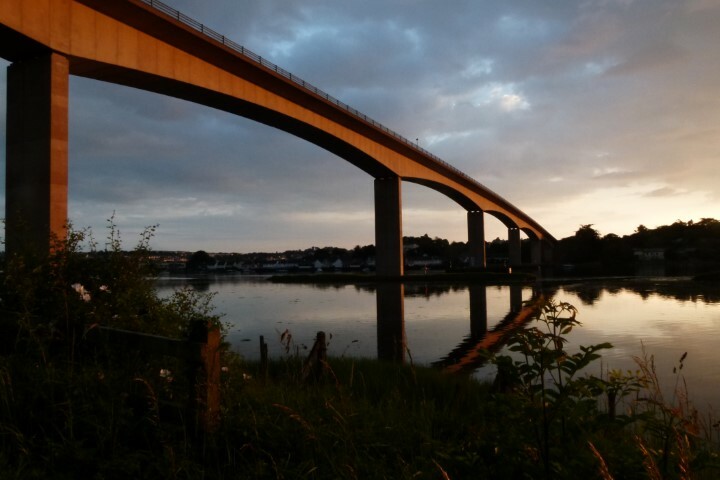 To do so required the building of the Torridge Bridge, an award winning pre-stressed concrete structure, which holds its 300m spans high above the river. This imposing structure is visible from many parts of East-the-Water. Whilst it no-doubt diverted passing trade from Bideford town centre, it removed the reliance on the old bridge. The new bridge, together with the ambitious North Devon Link Road project (which opened in 1989), meant significantly improved road communication between Bideford and the rest of the country. Providing an impetus for the town’s subsequent rapid expansion. In 1988 the Bude Area Tourist Board realised that this improved route into the west could do with some promotion and introduced the concept of calling it The Atlantic Highway as a marketing device. The idea proved popular and the name has stuck. 1987 saw the destruction of a carpet warehouse in East-the-Water due to a fire.